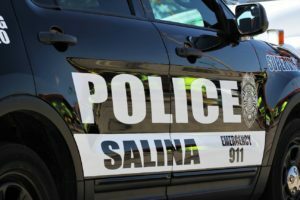 Thursday night, March 29 at approximately 9:30, police received a call from a woman concerned about a possible intruder in her home in the 700 block of Cherokee Drive in Salina. When the woman came home, she discovered her door was locked and the safety chain had been fastened from the inside. The police were summoned to investigate but found nobody inside the residence. Later that evening, the woman and her boyfriend heard a loud noise coming from the homes garage. Upon checking, the boyfriend discovered that the girlfriends ex-boyfriend had partially fallen through the homes ceiling. The current boyfriend then pulled Tyler Bergkamp, 25, of Salina, down from the attic. Bergkamp had a large knife and sheath on his person and got into an altercation with the boyfriend and threatened to kill him. Police arrived a second time to discover Bergkamp had been dragged to the front yard, where his knife had been taken away. Bergkamp now faces charges of aggravated burglary, stalking, criminal damage to property, criminal threat and possession.